It was a historic day for the BVI’s Men’s Rugby team with several firsts wrapped up in one. 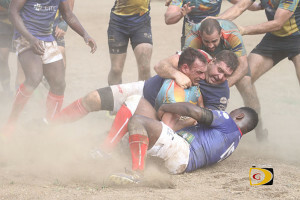 Led by an ironclad defensive effort, the BVI flogged Curacao for the first time; shut out their first opponent; won their first North American Caribbean Rugby Association (NACRA) South Cup Zone League; won their first home game in NACRA play, and advanced out of the group unbeaten for the first time in its history to face Barbados, following a 19-0 Saturday afternoon drubbing of Curacao. It all began unfolding seven minutes into play after Shamaire Spencer scored the first try and Rory Thornton converted for the BVI’s 7-0 lead. Noel Maxwell outran Curacao’s defenders just before halftime for 12-0 edge. Just before halftime, the BVI made one of two critical defensive goal line stands to deny Curacao’s tries and capped the scoring in the last minute on Austin Keil’s try, for the historic victory. Thornton explained that in last year’s Curacao game, they had a lot of young players, the defense wasn’t as strong, they missed a lot of tackles, gave up a lot of points and every try last year was the same. After losing to Barbados by a try in their last encounter, Solomon said they are ready to take them on. He added that they have some housekeeping to do in the fitness department as they are playing a better team and have to be more prepared.